A young couple with a bold and chic design sensibility thoughtfully creates their dream home with plenty of wow factor. When Hill and Jonathan Aeiker were planning their dream home, they knew three things for sure. First, they preferred for it to be located in the Mary B. Austin Elementary School zone. Hill had attended the school as a child and wanted the same experience for their future children. Second, they would need a custom design with a thoughtfully planned layout. “As a contractor, I knew I would never find an existing house that I was 100 percent pleased with, ” Jonathan says. And finally, the decor would have to pack a punch, with interesting materials and plenty of color and pattern, to reflect their whimsical yet refined personal taste. The tall order took a bit longer than they had expected — six years, in fact — but the home was well worth the wait. Fortuitously, on a typical Mobile day in 2010, Jonathan Aeiker made a turn that would set them on their path. He pulled off a main thoroughfare onto a side street to take a phone call and saw a “for sale” sign tacked on a tree. The previous home there had burned, leaving an empty lot and blank canvas for the artistic couple. Both agreed that the location was what they had hoped for. “We bought the lot and then took our time seriously thinking about how and what we wanted to build, ” says Hill. Two years after buying the lot, their focus shifted. Jonathan felt the time had come to start his own general contracting company, Aeiker Construction Corporation, with an emphasis on municipal and commercial projects. “The house building process took longer than we anticipated because income-producing jobs always came first, ” Jonathan says. Around the same time, Hill gave birth to daughter Lila, now 4. 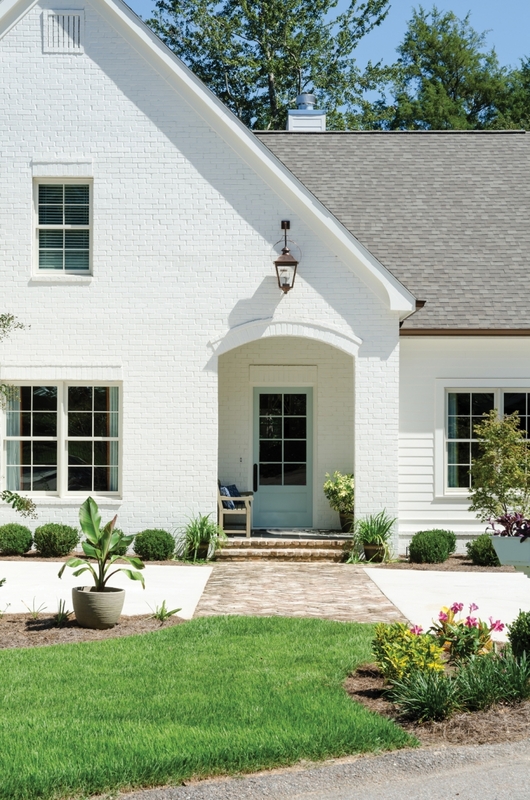 For two more years, the couple painstakingly worked through the home plans when time allowed. They began by finding an initial floor plan they both liked. 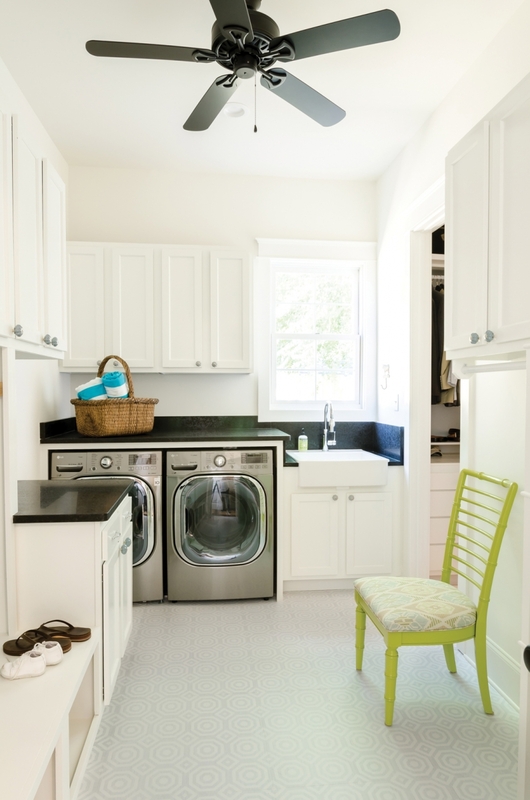 Then they met with designer Jean Savell, who helped them make thoughtful choices that would make the space work for their exact wants and needs. “Thankfully, being in construction, I knew what materials and methods were available and who I would use to implement them, ” says Jonathan. Once ground broke, it would take another 18 months for construction to be completed. During that time, son Garner, now 1, also joined the family. Throughout the planning, Hill kept a file of images she liked for the interior spaces and shopped for their home while on trips to visit family in Louisville, Kentucky. 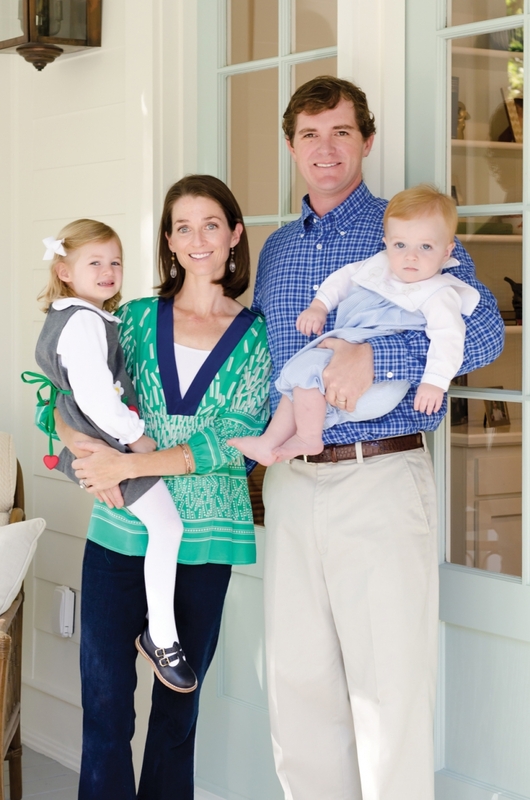 “I found a lot of ideas from magazines, Pinterest and Houzz, ” says Hill. A craftsman hobbyist, Jonathan actually fabricated much of the built-in shelving and even the zinc fireplace surround and vent-a-hood over the stove. 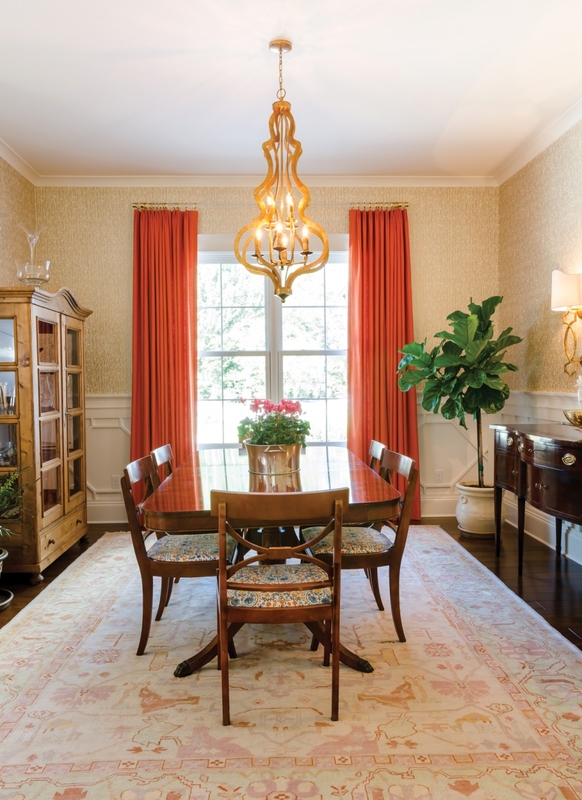 While they designed about half the project themselves, the Aeikers also relied on professionals, such as designer Jean Savell, residential designer Robert McCown, interior decorator Natalie Roe and interior decorator Chenault James. 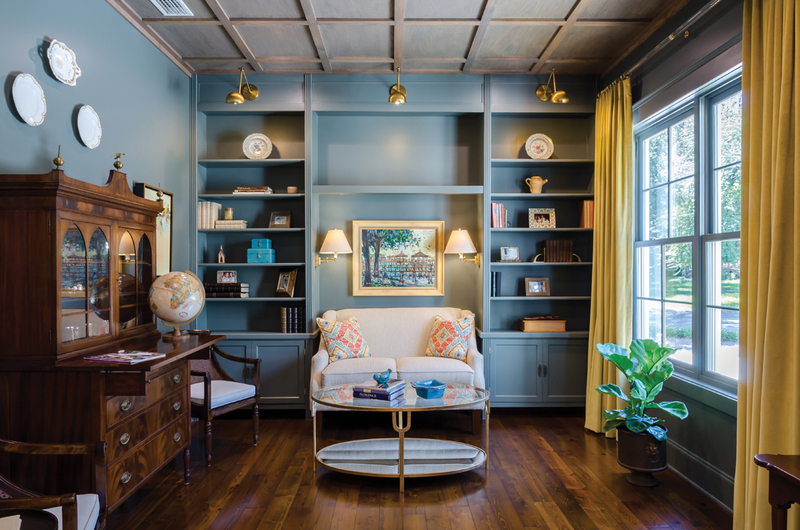 The overall style of the finished home is a perfect juxtaposition of old and new, traditional and modern. That aesthetic is evident from the first stroll up the front walkway, which is made from vintage brick salvaged from the old Battle House Hotel and laid in a trendy herringbone pattern. 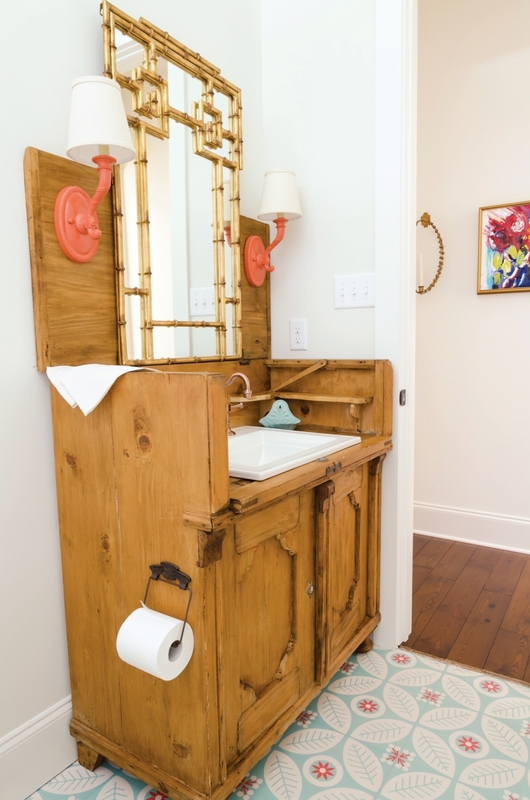 Inside, the team pulled together a whimsical combination of modern furnishings, statement wallpaper and luxe, patterned fabrics coupled with rustic antiques, elegant wainscoting and timeless architecture. The wow factor is a bold accent palette of orange, turquoise and green that truly pops against crisp white walls and gray cabinetry. The Aeikers couldn’t be happier with the results. “Often I get bogged down in thinking I can make things perfect, ” says Jonathan. “But, I have learned that everything and everyone involved in the building process is imperfect. 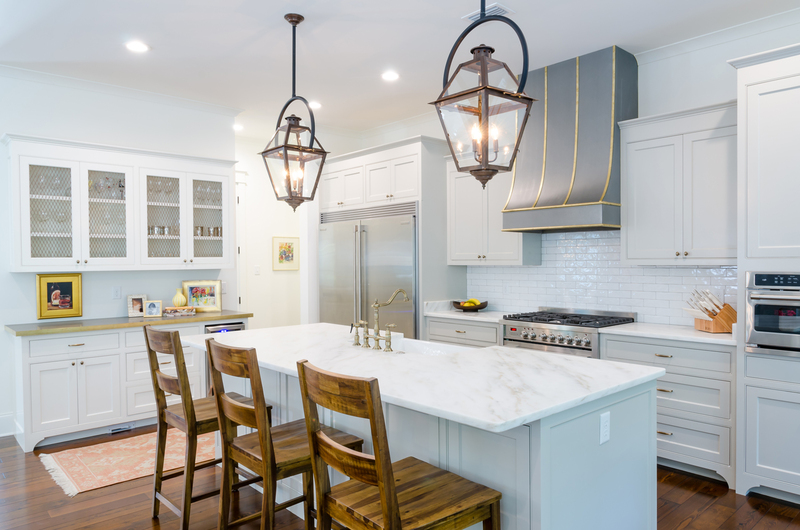 If you keep your head high, trust and have faith, it all comes together in the end.” Now that the project is finally complete, the family of four is happily living life in their new, traditional home, full of contemporary designer flare and lots of dreams. 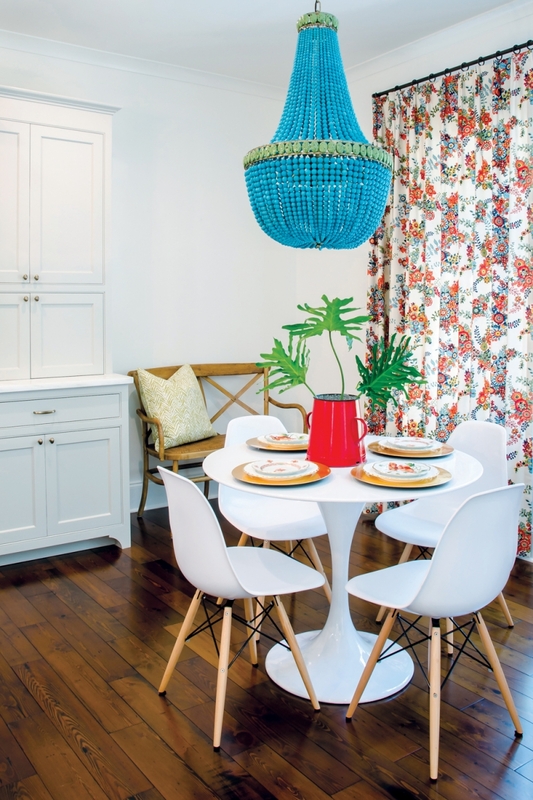 ABOVE LEFT A turquoise chandelier makes a bold statement when paired with a sleek white dining set in the breakfast nook. ABOVE RIGHT The sink in the powder room was salvaged from a project at Woodcock Elementary School and painted with a yellow lacquer. 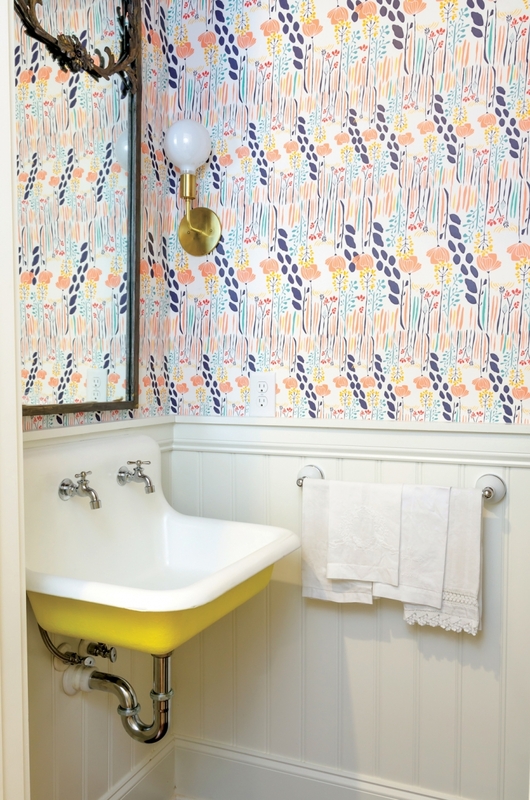 Keeping with the home’s bold colors and pattern, a floral print wallpaper (Leah Duncan for Spoonflower, Summer Grove in Day) hangs above whitewashed wood paneling. 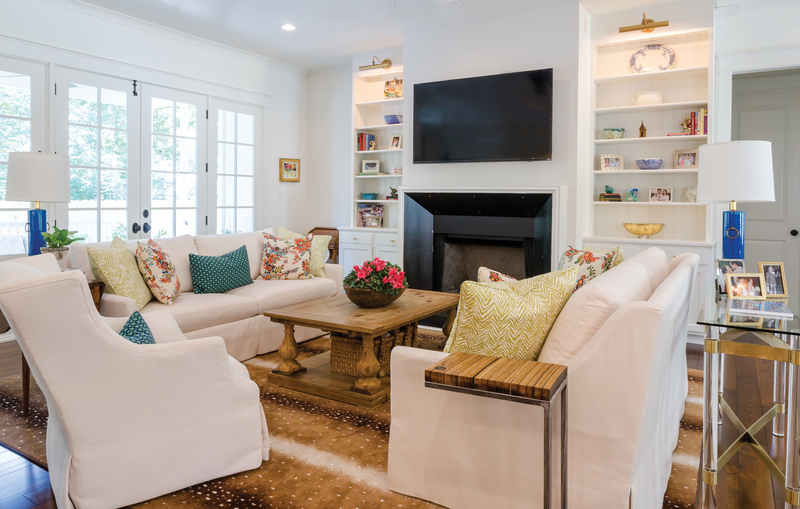 ABOVE For the family room, Hill envisioned a large antelope rug, and the room was decorated around the piece. 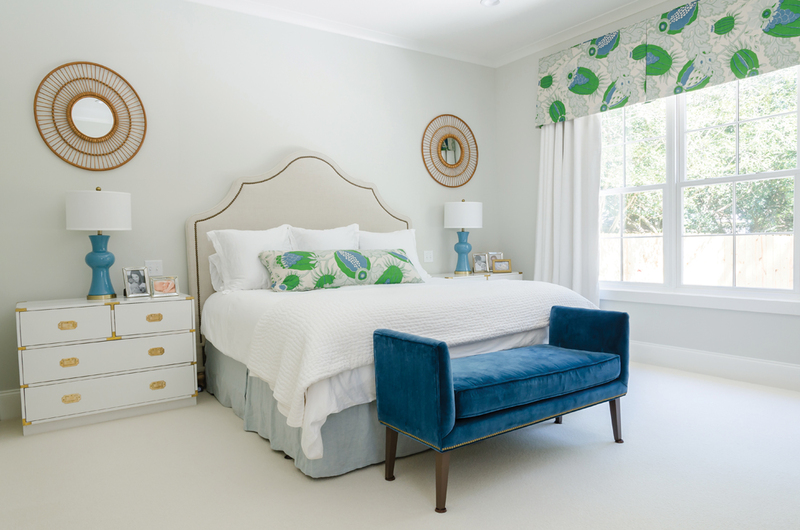 Natalie Roe helped find fabric for the pillows that brought more pattern and color to the room while complementing the rug. Jonathan built the custom shelves and zinc fireplace surround himself. 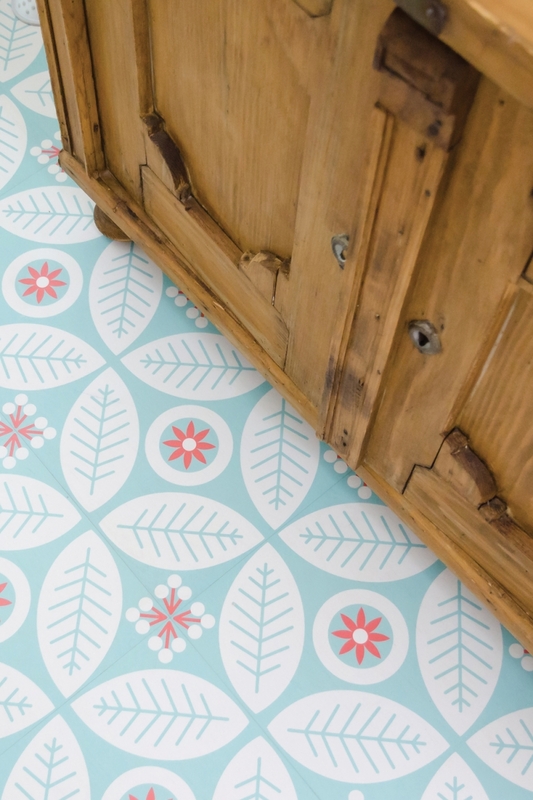 ABOVE In the guest bathroom, a peel-and-stick floor (Mirth Studio, Flower Folk Tile) adds a punch of color and pattern. A sideboard from Charles Phillips Antiques and Architectures was repurposed as a vanity with a mirror from Colonial Designs in Louisville. Hill found the sconces on Spring Hill Trading, and simply painted them coral and added new shades. 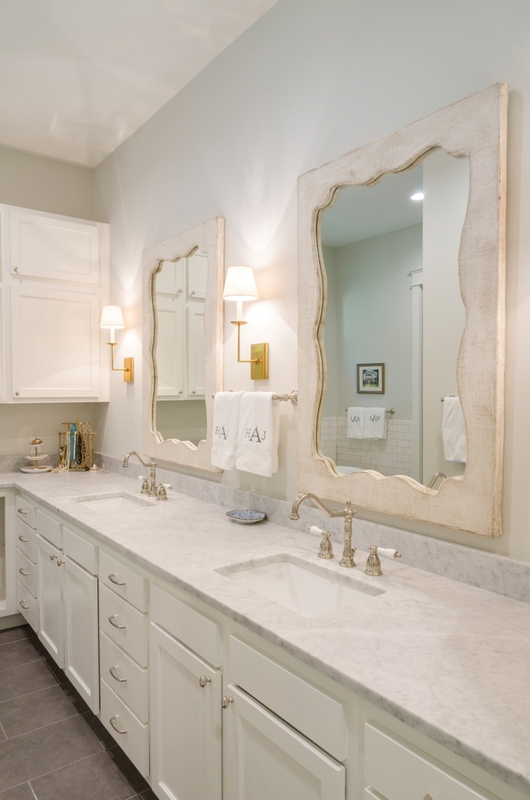 ABOVE LEFT Natalie Roe found twin mirrors to go above his and her sinks in the master bath. Hill requested dark floors, and Jonathan built the cabinets himself.